Roger is making the information available to all via this post. Copied without amendment, statements and opinions are his alone. Tire selection for a car used to be a pretty simple and straight-forward process. For some people it probably still is, though for MINI owners who are interested in finding the best possible tires for their cars, it’s important to have some understanding of tire design, construction, and purpose, among other things. For decades, going back at least to the 1930s, automobile tires were constructed with carcass plies laid on the bias – that is, the cords crisscrossed each other at about +/- 60 degrees from the direction of travel. When the laid-up carcass of a bias-ply tire was placed over a curing bladder, put into a mold, and then cured, pressure from the curing bladder pantographed the bias angle under the tread to about +/- 36 degrees, and in the sidewall to about +/- 45 degrees while the bias angle at the bead remained at +/- 60 degrees. These induced differences in the bias angle of the carcass provided rigidity to the tread area and allowed the sidewall to flex more than the tread area did, helping cushion the ride. With all tires being constructed using basically the same manufacturing techniques, and with rubber technology not as advanced as it is today, there was not much difference between passenger car tire brands or models. For virtually all consumers, it came down to a simple choice between brands (do you like Firestone, Goodrich, Goodyear, or another brand?) and the question of whether or not you wanted/could afford whitewalls (which cost more and which were considered “fancier”). Otherwise, consumers bought the same size tires as had come on their cars and that was the end of it. The only exception to this was for residents of areas where it snowed in winter – those people usually had a pair of “snow tires” that they’d have mounted on their rear wheels in late fall to provide better traction in winter weather. In 1946, Michelin produced the first commercially successful radial tire. In contrast to bias-ply tires, radial-ply tires have carcasses with the cords laid very close to +/- 90 degrees from the direction of travel. Because the carcass plies, when laid up in this manner, cannot by themselves produce sufficient tread stability, woven belts of fabric or steel surround the carcass on the outside underneath the tread area. Michelin and some other manufacturers used steel belts, though for several years Continental and Pirelli seemed to prefer fabric belts. Radial-ply tires slowly gained favor in Europe and eventually became available in this country. 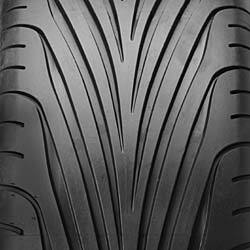 As imported radial-ply tires began to make inroads into the American market during the 1960s and 1970s, domestic tire manufacturers responded by producing bias-ply tires with a fabric reinforcement belt under the tread – “belted bias-ply” tires. That design was marginally better than a plain bias-ply tire, and could be made in a wider profile to provide better traction for muscle and pony cars of the era (think Pontiac GTO, Chevrolet Camaro, Ford Mustang, the Beach Boys “409”, etc). Today, because radial-ply tires are so superior in overall performance to the old bias-ply tire design, radials are virtually all you can find available. This is a good thing. The change from bias-ply to radial-ply construction in the American tire industry was not without its problems. Bias-ply tires had always been cured using “clamshell” molds, so named because they opened and closed like a clamshell around the curing bladder. After the mold was closed on a tire to be cured, the curing bladder was inflated to force the tire outward against the surrounding mold, thus creating the panto­graph effect in the carcass cords as mentioned above. Because the bias-ply carcass could adapt itself to this stress as it was applied, there were only minimal quality-control issues. Having only clamshell molds available, American manufacturers produced many of their first steel-belted radials with those molds. However, steel-belted radials don’t take kindly to being cured in a clamshell mold. Michelin figured this out back in the 1940s, but it took a lot of bad publicity before American manufacturers understood. With a steel belt holding the tread in place, and the radial cords unable to pantograph to a slacker angle when the curing bladder was expanded, a great deal of stress was placed on the carcass and belt of the tire. This made the tires prone to such nasty surprises as throwing the tread and then blowing out because the belt had actually broken under pressure in the mold. I had a Firestone do that to me at 50 mph one day, and it came as quite a shock because I was driving a brand new rental car at the time – it had less than 1,000 miles on the odometer. The proper technique for molding steel-belted radial tires is to use a “segmented” mold to cure the tire. With this mold, after the laid-up carcass is put into the mold, segments of the mold (shaped like hollow slices of a piece of pie) squeeze in against the uncured tire. Pressure on the tire-to-be is exerted from the outside, not the inside. Therefore, no serious stresses are created in the cured tire. It is very easy to determine if a tire has been cured in a clamshell or a segmented mold. Simply look at the tread carefully and find the left-over mold marks. They will be very thin ribbons of rubber that extend vertically about a millimeter or so away from the surface of the tire. If there is only one mold mark and it runs around the tire tread just about dead center in the tread, you’re looking at a clamshell-molded tire. If, on the other hand, the mold marks cross the tread from side to side in several different locations, you’re looking at a segment-molded tire. 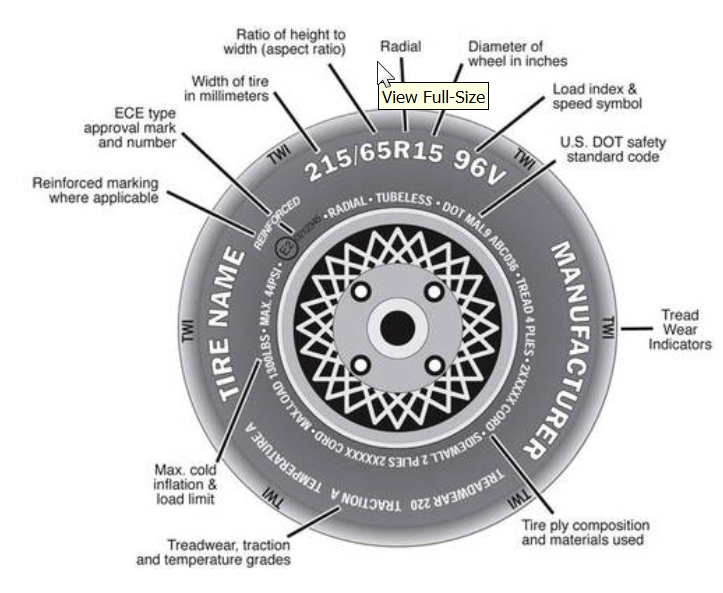 Today, nearly all steel-belted radials are produced in segmented molds, but it’s still something that should be checked, especially if you are purchasing steel-belted radials that have been made by a company headquartered in the U.S. The process of buying tires for your MINI starts with deciding whether or not you are happy with the tires that are being replaced. If you are satisfied with them, and if you feel no particular need or desire to get “better” tires (“better” can have many different and often conflicting definitions, depending on who’s doing the defining), then simply buying the same tire again is probably going to work fine for you. On the other hand, if you are looking for something “better”, there are more decisions ahead. For instance, do you want run-flat tires or non run-flat tires? Do you want an all-season tire that will enable you to survive an Iowa winter, or do you want a super-duper curve carver for the summer months and then a separate set of tires to provide driving fun in the winter? What about tire sizes – should you stay with the stock size or can you/should you go oversize? Will you be taking the car to a driving school? Doing an autocross or two? Is wet-weather traction of critical importance? What about tread life? What about a comfortable ride? The decisions you make about your tires are critical to how your MINI will handle. The four contact patches those tires make with the pavement are the only means by which you can accelerate, brake, and corner. The better the grip, the better your MINI will do those things. Grip, in turn, depends on a variety of factors such as tread compound, tire pressure, tread design or pattern, and the amount of elasticity the tire has. Because tires are elastic, they deform under any load applied and return to their original shape when the load is removed. In a corner, tires deform sideways in the area of the contact patch, and this is what makes your MINI go around the corner. However, the distortion of the tire makes your MINI (and every other car) follow a path that’s at an angle to the direction in which the wheel and tire actually point. This is referred to as the “slip angle”, and it is the slip angle that provides feedback through the steering system telling the driver what’s happening where the rubber meets the road. Under “normal” conditions the slip angle makes the car run in a wider arc than it would follow if there were no slip angle at all – the larger the slip angle, the wider the arc the car will follow. Very small slip angles give the driver a sense of having very precise steering and a very responsive car. Very large slip angles translate to essentially having lost traction as the front tires are turned sharply in relation to the vehicle’s direction of travel but the car skids instead of going in the direction the wheels are pointed. This condition is also called understeer. Oversteer is the opposite situation – it’s where the slip angle is reversed and the car follows a tighter arc through a corner than it would if there were no slip angle at all. The typical symptom of oversteer is the rear end of the car breaking loose and sliding toward the outside of the corner. Most drivers will experience oversteer either in very slippery conditions or if they have overcooked a corner and either take their foot off the throttle (trailing-throttle oversteer) or step on the brakes (trailing-brake oversteer). What happens as a car approaches and then exceeds the limit of available cornering force is that the slip angles become larger and larger until they finally are so large that the tires have no more ability to generate cornering force and the car skids. At the point a skid starts, the car is no longer going in the direction the driver wants it to go. In skids caused by understeer, the car tends to plow straight ahead; in skids caused by oversteer, the car tries to reverse ends and perhaps spin. The best description of understeer and oversteer I’ve ever heard is that skids caused by understeer mean the driver will need a change of underwear, while skids caused by oversteer mean the passenger will need a change of underwear. Having tires on your MINI that provide you with the best traction possible for your driving style will reduce the chances of anyone in the car needing a change of underwear. Generally speaking, only those MINI owners with an “S” need to be concerned about this issue. Because the space used for a spare on a regular Cooper gets taken up by the battery on an “S”, there’s no convenient location to carry a spare in an “S”. MINI addresses this by equipping “S” cars with run-flat tires. Theoretically, these tires will allow you to drive up to 50 miles at reduced speeds so you have sufficient distance in which to find a tire repair facility. Run-flat tires get the ability to do that by having extremely stiff reinforced sidewalls – stiff enough that they can bear the weight of the car without having any air pressure in them. Many people feel comforted by this, and cannot conceive of driving without them in the absence of a spare. Many others, and I’m included, consider run-flat tires undesirable and take the first available opportunity to get rid of them. Although the technology continues to improve, it is still true that run-flat tires suffer from the following characteristics: 1) because run-flats have much stiffer sidewalls, they provide a harsher and less forgiving ride than do non run-flat tires. In addition, they do not provide as much steering feedback in corners as do non run-flat tires whose sidewalls flex more under cornering loads; 2) they are not readily available everywhere in the U.S., so if you limp into a small town in many places in the country you’re going to be stuck there until someone like the Tire Rack or Discount Tire can ship a replacement tire to you, assuming someone in a small town has the right equipment and knows how to remove and mount run-flat tires; 3) they weigh more than non run-flat tires, increasing the amount of unsprung weight with which the suspension must cope; and, 4) they’re much more expensive to purchase than a non run-flat tire (in size 205/45 X 17, the stock MINI size for 17-inch wheels, Tire Rack currently has 18 models of run-flat tires and 29 models of non run-flat tires. The run-flats cost an average of $216 per tire, while the non run-flats cost an average of $128 per tire). I ditched my run-flats as soon as I wore most of the tread off them, and I’ve since put more than 90,000 miles on my MINI with non run-flats. In that time I’ve had two punctures, both in town, both discovered very promptly through the tire monitoring system in my car, and both repaired quickly at the nearest tire repair shop. In both cases I was back on the road in less than half an hour. To cover myself in case of a flat on the open highway, I carry a jack and what BMW euphemistically refers to as a “mobility kit” – tire plugs with the tools to insert them, sealant so the plug can seal up the puncture, and a good compressor to restore air pressure. The way I look at the finances involved, the mobility kit cost me about $100, I’ve spent about $50 on tire repairs, and over the five sets of tires I’ve purchased since ditching the run-flats, I’ve saved more than $1,700 in purchasing costs. In addition, I’ve never been stranded anywhere, and for more than 90,000 miles I’ve enjoyed better handling and better ride quality. Ultimately, for “S” owners, the choice is up to you. If you can live with the drawbacks of run-flats and they provide you with invaluable peace-of-mind, that’s fine. On the other hand, if you want to get rid of them, it is both possible and rational to do so. All-season tires are designed as a compromise between high-performance dedicated summer tires and dedicated winter tires; while providing reasonable performance during the summer, all-season tires can also be used with reasonable results in the snow, ice, and slush we see in Iowa each year. As such, they give up some amount of maximum grip in summer conditions in return for having better grip in winter conditions. Typically this involves a tread compound that remains more elastic at low temperatures and a tire tread design that provides more biting edges for traction in snow. Until I bought my MINI, I used all-season tires and never got stuck during an Iowa winter. Dedicated summer tires typically are sold as “max performance”, “ultra-high performance”, or “extreme performance” tires (there are no universally-accepted definitions for any of those categories – they’re basically just advertising terminology) and invariably come with a warning that they are not to be used on snow, ice, or when the temperature falls below about 40 degrees Fahrenheit. Also, typically, they have a softer tread compound than do all-season tires, which is why they have more grip in corners and why, when cold temperatures make them harden up, they have so little grip as to be potentially hazardous in snow and ice. Dedicated snow tires are designed only for use in winter and cold-weather driving. They have a tread design that will feature the latest thinking on creating biting surfaces to provide traction in snow, and in most cases the tread compound will have been formulated to provide good traction on ice without having to put studs in the tires. They do not provide anything even approaching reasonable amounts of traction in summer driving because they get so far out of the heat range for which they’re designed that they feel as if they’re being driven on greasy/slippery surfaces. Also, it is important to note that many manufacturers are today making dedicated winter tires with dual tread compounds; the first portion of the tread to wear off will be the portion compounded to provide maximum traction under all winter conditions. After that portion has worn off, you’ll find you’ve hit a preliminary set of wear bars. This tells you that even though you still have usable tread life in the tires you should replace them for continued maximum winter driving performance. In addition, because you will be down to approximately half the total usable tread depth, your tires will no longer evacuate slush and general winter slop from under the tread area nearly as well as will new tires. Those two facts make it important to replace most brands and models of dedicated winter tires when the first set of wear bars is exposed. 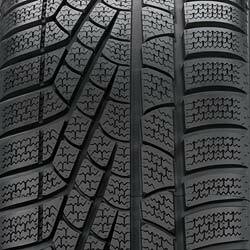 Note that the Bridgestone Blizzak is a directional symmetric snow tire, while the Pirelli Winter Sotozero has a directional asymmetric tread pattern. Also, note all the extremely small grooves in each tread block – these are called sipes, and having a lot of them helps winter tires provide better grip in the snow. See below for more on tread patterns. Your choice of using all-season versus dedicated summer and dedicated winter tires shouldn’t depend on what others do. There are good reasons for either choice. My choice is to use maximum grip summer-only tires for good weather, so I can have the most fun possible in curves, and put a separate set of steel wheels mounted with dedicated snow tires on in late fall to get me through the winter. Come fall or spring, I just jack up the car and swap the wheels. One caution on this practice – be sure you own and use a good torque wrench to tighten the lug bolts. Too much or uneven torque on the lug bolts can cause problems with warping; too little torque can lead to loose or lost lug bolts. Both conditions are hazardous to your health. 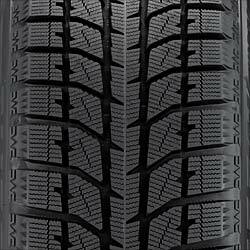 Tread life for all tires other than dedicated winter tires is rated with a “Uniform Tire Quality Grade” number that you’ll find molded into the sidewall of your tires. It will range between a low of perhaps 120 and a high of perhaps 500, though there are tires available that have lower and higher ratings. In general, the higher the number, the more miles you should expect to get out of the tire before it is worn to the point of replacement. At the same time, and only as a general rule because there are known exceptions, tires with higher UTQG tread wear numbers will have a relatively harder tread compound (to get longer tread life) and reduced levels of traction under all conditions (because, within limits, a harder tread doesn’t grip the pavement as well as does a softer tread). Your experience will certainly be different from mine, but UTQG numbers are comparable from brand to brand, and seem to be linear in a relative sense. For example, I’ve found that with high-performance summer tires UTQG rated 280, I can get approximately 22,000 miles of use before I need to replace them. Because the tires I’d been using are no longer made in a size to fit my MINI, I changed to a different brand the last time I purchased tires, and got tires with a UTQG rating of 360. That means I should be able to get about 28,000 miles from the tires. Right now I’ve got about 23,000 miles on them, and there’s about 15% of the usable tread left, so I could probably get about another 4,000 miles from them. Because I plan to do MTTS 2014 in its entirety next summer, I’ll just put new tires on next spring in anticipation of the event. You should be able to make comparable comparisons based on your own experience with tires of a known UTQG grading. Many tires these days come with directional and/or asymmetric tread patterns. 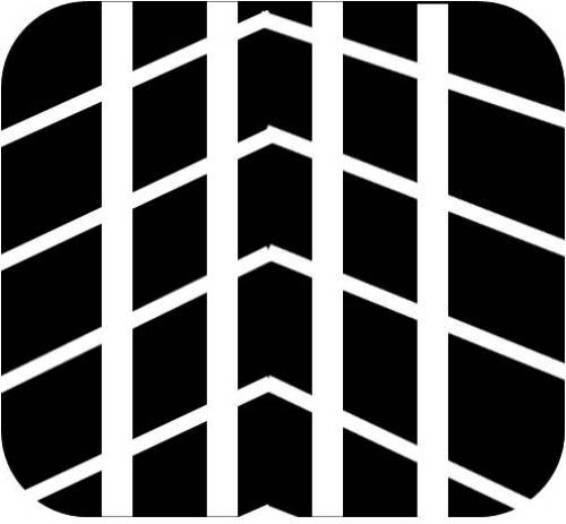 The reason for such patterns is that they are believed (no doubt based on extensive testing by the manufacturers) to provide better traction and/or more resistance to hydro­planing than do other tread patterns. Michelin XAS tread – if you look closely you should be able to see a segment-mold mark. 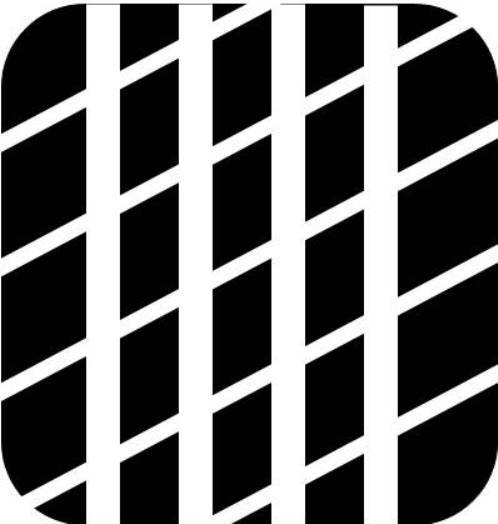 A directional tread pattern is different. Tires with directional tread patterns may be symmetric or asymmetric. Directional symmetric tires do not have an “inside” and an “outside” edge, but directional asymmetric tires DO have an “inside” and an “outside” edge. The major point about directional tires is that they are designed to rotate in only one direction, and this is generally related to the tread’s ability to evacuate water from the road surface and prevent hydro­planing. Directional tires, whether symmetric or asymmetric, can be rotated only from front to back (unless you have them dismounted and remounted), and all will have an arrow molded in the sidewall showing the correct direction of rotation. Mounting directional tires so they rotate in the wrong direction is likely to severely decrease your available traction just when you need it most – in heavy rain. About two years ago I saw a car in a parking lot with all four directional-tread tires mounted for reverse rotation. I left a note on the windshield, telling the driver of the problem and explaining he needed to get it fixed quickly for safety’s sake. I hope he did so, because in heavy rain his tires would channel water under the tire tread instead of away from it, severely increasing the risk of hydroplaning, even at relatively slow speeds. What do those numbers mean? The first number is in millimeters, the second is a percentage, and the last is in inches. The first number is the cross-section of the tire at its widest point, while the second number provides what’s called the “aspect ratio” of the tire. The last number is the diameter of the wheel where the tire’s bead seats when inflated – 15, 16, or 17 inches. For example, a 175/65 X 15 tire has a cross sectional width of 175 mm (about 7¾ inches) and the aspect ratio tells you the sidewall height is 65% of the cross-sectional width, or about 114 mm (about 4½ inches). The tire is designed to fit a wheel of 15 inches in diameter. The lower the aspect ratio, the more the tire will look like a rolling rubber band, and using tires with extremely low aspect ratios exposes the driver to serious wheel damage, even from normal bumps. A MINI-owner I know in Virginia went from 17-inch wheels and 45-series tires to 18-inch wheels and 35-series tires. He didn’t mind the somewhat harsher ride, and he really liked the crisper handling, but it took him only about four months before he hit a bump and trashed a $300 wheel from the impact. He has since gone back to 17-inch wheels and 45-series tires. Going “oversize” typically means increasing wheel diameter while at the same time decreasing the tire aspect ratio (for example, going from 16-inch wheels and tires with an aspect ratio of 65 to 17-inch wheels and tires with an aspect ratio of 55 would be considered going one oversize). When going oversize, the goal is for the new combination of wheels and tires to have the same rolling diameter as the original combination (plus or minus a very slight amount). In addition to changing wheel diameter and tire aspect ratio, in some instances it may be necessary to increase the cross section of the tire by 10 millimeters to keep the old and new rolling diameters relatively equal. For MINI owners considering going oversize, The Tire Rack’s website lists the number of revolutions per mile for nearly all of its tires. This makes it very easy to determine which tire size should be chosen so the new combination of wheels and tires has as nearly as possible the same rolling diameter as the old combination had. MINI drivers usually “oversize” their wheel/tire combinations in order to gain more traction and improve handling characteristics. Having a wider tire increases the amount of tread in contact with the road (more traction) while having tires with a lower aspect ratio tends to result in stiffer sidewalls in the tire, reducing sidewall flex when cornering (improved handling). An aesthetic consideration also motivates some drivers – having larger wheels with lower-aspect tires is considered to improve the appearance of the car irrespective of any traction and handling benefits. An example would be: keep an existing set of 17-inch diameter wheels but change from 205/45 X 17 tires to 215/45 X 17 tires. This technique is what I have personally used on my car because it produces a slightly increased rolling diameter relative to the stock 205/45 X 17 tires. An example would be: start with 16-inch wheels shod with 195/55 X 16 tires and change to 17-inch wheels shod with 205/45 X 17 tires. Notice that the cross sectional width has been increased. This is because failing to do so will add approximately 5% to the driver’s observed odometer and speedometer errors. Adding 10 millimeters to the cross sectional width reduces the size of the errors to just over 1%. As a general rule, it is possible to go one-oversize on all MINIs. However, because there’s very limited space in a MINI’s fender wells, going two-oversize usually runs the risk of rubbing the tires at some point. They may rub only when you turn into your driveway or under other limited circumstances, but they may also rub on a much more frequent basis, which can cause premature tire failure. Likewise, it is probably not a good idea to use an equivalent size with more than a 10% decrease in sidewall height, as the tire cross section is likely to become too wide to be used without rubbing issues. Given the limitations on how much it’s reasonably possible to go oversize on a MINI, why would anyone consider it? In my case, going plus-zero gained me some additional tread on the road for better traction because there’s more rubber in contact with the road. It also eliminated about half the built-in optimism in the MINI speedometer and odometer. A driver going plus-one will not only gain the extra traction, but he/she will also gain slightly improved handling but may slightly increase the built-in optimism in speed and miles traveled. The best news is that going plus zero doesn’t cost very much additional per tire, so for a minimal additional expense you can put more rubber on the road (always a good thing for driving a MINI) and correct about half of the roughly 4% optimism MINI builds into your speedometer. There are two relatively minor drawbacks: first, the slightly taller sidewall will minimally lessen the crispness of turn-in response you experience in cornering; and second, you will lose a very slight amount of wet-weather traction. There are ways to address the first, but that involves suspension tuning and will not be discussed here. My experience with using plus-zero oversize tires in wet weather is that the decrease in wet-weather traction is so slight I can’t honestly say I felt any difference at all. In fact, when I ditched the original run-flat tires and installed non run-flat tires, I experienced an increase in wet weather traction relative to the OEM run-flats. MINI owners (and all car owners) should avoid having their tires/wheels balanced on a static bubble-balancer. These used to be ubiquitous because of the cost involved in having dynamic balancing machines, but they are fortunately almost completely gone from the scene. Dynamic balancing on a spin-balancing machine is the minimum that should be considered acceptable. This machine takes the mounted tire/wheel combination, spins it up to several hundred rpm, and determines how much weight should be applied to which specific spots on the wheel rim in order to bring the tire/wheel combination into dynamic (or rotational) balance. Spin-balancing machines are commonplace today. An improvement on the spin balancer is known as “road force balancing”. This is a dynamic balancing technique that places up to 1,400 pounds of load pressure on the inflated tire and then determines how much radial and lateral runout the combination has (radial runout is the amount of deviation from perfectly circular and lateral runout is the amount of deviation from a perfect plane as the wheel and tire are rotated about the car’s axle). The operator then corrects for any runout found as best he can (there are going to be instances where manufacturing quality controls don’t catch unacceptable products, so not all instances of runout can be corrected) to bring the combination within specification. Once that’s accomplished, the tire/wheel assembly is balanced. Lead weights used to be standard in wheel balancing, and every time a wheel was balanced the old weights were removed and thrown away – by one estimate I’ve seen, that practice put more than 20 tons of lead back into the environment every year. Because lead is toxic, lead wheel weights are being phased out. Do the environment a favor and request that newer-style weights without lead be used on your wheels. MINIs are smart – they can and do monitor your tire pressures and will alert you if one tire is losing pressure. Second gen MINIs have a tire pressure monitoring system with pressure moni­tors in each of the car’s wheels, while first gen cars use the ABS sensors to detect differ­ences in wheel rotational speed. TPMS sensors can present problems for those who don’t know how to work with them when mounting new tires. Basically, whenever you have a tire taken off a wheel with a TPMS sensor installed at the valve, the sensor should get a new “O”-ring seal, a new aluminum nut to anchor it in place, and a new nickel-plated valve core. Don’t accept brass valve cores because most TPMS sensors use alumi­num valve stems and brass cores will generate galvanic corrosion in the stem, leading to pressure leaks and the expense of a new TPMS unit for the wheel. Also, never use tire-sealing goo (such as “Slime”) in any wheel with a TPMS sensor in it. The goo will make a royal mess of the sensor and may cause it to malfunction. Sensors are expensive (they can cost up to $200 each) so you don’t want to damage them with tire goo. If you need to carry a “mobility kit”, get one that has tire plugs and the tools with which to install them. The temperature grade tells you, based on a standardized test, how well a tire dissipates heat that builds up as the car is driven. Here are tables that translate each of those designations. Because real-world conditions are never identical to conditions of the standardized tests used to determine the above grades and codes, it is critical that they be used only as a general guide to the relative quality of tires. Just because a tire is rated 91W AA/A doesn’t automatically mean you won’t go flying off the road if you take a wet corner at 120 mph while generating .30 g’s, or that you won’t blow a tire due to heat accumulation from an extended run in West Texas at 120 mph with an ambient air temperature of 110 degrees F. Those grades and codes only tell you that a 91W AA/A tire is less likely to fail under either of those scenarios than is a 75Q B/B tire. This is all nothing more than good common sense. Look at your tires when you get gas. If one looks softer than the others, check the pressure. Make sure your tires are always properly inflated. Buy and use a good digital tire pressure gauge. Good gauges are inexpensive, and all tires lose pressure gradually. If all are losing pressure at the same rate, which is usually the case, your tire pressure monitoring system most likely will NOT notice the slight decrease that takes place over a month or two. Check the tread periodically for embedded stones or other debris. Remove what you find – it may save you from having a flat tire. Rotate your tires. Even if you only rotate them front to back/back to front, you will even out the wear on all four and not put yourself in the undesirable position of having two well-worn tires on one end of the car while the other end of the car has tires in much better condition (and which therefore will provide significantly more traction). If you have a spare you can work it into the rotation or not as you desire. 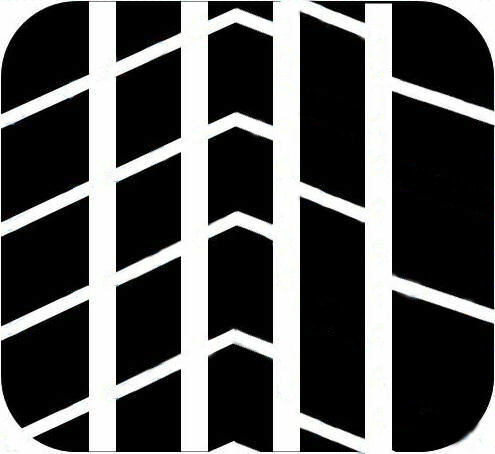 If you do include it in the rotation, be sure it’s appropriate to put it where you want; check the tread pattern and verify that it’s not a directional tread that you’re going to put on the “wrong” side of the car. Pay attention to the tread depth. The old “penny” test (stick a penny with Lincoln’s head pointing in toward the center of the wheel) is a rough but quick test for having adequate tread. If you can see all of Lincoln’s head, it’s time for new tires. Tread depth gauges that tell you actual depth in 32nds of an inch probably cost less than $5 today (I bought mine in 1965 for less than a buck) and are well worth having and using because they’ll allow you to spot uneven wear across the tread before it causes severe premature tread wear. (Finding uneven tread wear is usually a sign of an alignment or balancing problem, but that discussion will be deferred to a later article). If you use dedicated winter tires, you should be aware that when about 50% of the tread has been used you’ve used up the portion of the tread that was specifically compounded for maximum snow traction. You probably should consider replacing them even though there’s still a fair amount of tread left because they won’t handle slush, wet snow, or heavy snow nearly as well as you’d like. So, with all of the above information in mind, how do you choose one tire over another (assuming your replacement choices all meet or exceed the UTQG codes/ratings that applied to your originally-mounted tires)? I have always used two methods. First, I read as many tire comparisons as I can find (The Tire Rack is a great source of unbiased comparison test reports and undoubtedly biased actual-user comments that you can read on line), and I used to subscribe to both Road & Track and Car & Driver where such tests would periodically be published. Consumer Reports has an outstanding reputation for independent evaluation of all kinds of products, and they test tires as well as toasters and cameras. Second, and perhaps more useful, is to find someone who’s currently running the tires you are con­sidering and talk to that individual. Ask what he/she likes about the tires, what he/she doesn’t like, and ask about the qualities that are important to you. You might be considering a truly superb high-performance summer tire but you value long tread life more than maximum traction. Talking to someone who’s got those tires may reveal he/she expects to get no more than 12,000 miles from them, and that might help you avoid an unpleasant surprise. Whatever tires you get, always buy at least two – it is almost guaranteed that replacing only one tire with a new one, even of the same brand and model, will create inconsistent handling problems. Even better is that you replace all four at the same time, which means that your tires have been wearing equally evenly over their lives. And, if you opt for dedicated winter tires, you absolutely need to get four of them so you have the same handling characteristics at each corner of the car.